Zimbabwe's loss-making state airline has announced a 500% increase in fares, making air travel impossible for all but the country's most wealthy. Air Zimbabwe said spiralling costs had forced it to increase ticket prices on all domestic and international routes. Zimbabwe's economic crisis, the worst since independence in 1980, pushed inflation to over 1,000% last month. 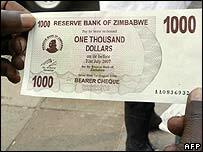 A return trip between London and Harare now costs 1,865,000 Zimbabwean dollars, or $7,460 (£3,982). Even using black market currency exchange the trip would work out at $1,245 (£665). The country's central bank said last week that it would not continue to support Air Zimbabwe and other money-losing state companies. A spokesman for the airline, David Mwenga, told AFP news agency that it had little choice but to increase fares. "The goods and services we use everyday have been going up by at least 150% every month so we had no option but to review our fares upwards," Mr Mwenga said. "Prices are literally going up every time you wake up." He said the airline was only generating 30% of its revenue in hard currency. Although the official inflation rate stands at 1,000%, independent finance experts have estimated that the actual rate stands closer to 4,000%. Earlier in October, Zimbabwe banned several money transfer agencies from operating in the country, accusing them of abusing their licences by doing deals on the black market.